Welcome to the Early Years Foundation Stage section of our school’s website. 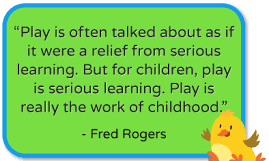 At SVP we love to learn through play and will have lots of fun as we work together this year. – playing can sometimes be messy so send in a change of clothes to keep on their pegs, and don’t be surprised if they do get messy as that means they have had a busy, exciting day and learned lots ! Lots of time to play indoors and outside, with well planned opportunities to learn. Time to work with their key person, learning new things. In Nursery we follow the Early Years Foundation Stage Curriculum. This has PRIME and SPECIFIC areas of learning. We spend lots of time developing pre writing skills through large and small motorwork such as using spades and brushes outside and malleable materials and tweezers inside. We also give the children lots of chances to explore mark making for real purposes. In this area we explore lots of ways to be creative. We explore colours, textures and a wide range of different media to show our thoughts and feelings. This may be through paint, blocks, music , dance, technology or role play. What has been happening in nursery ?